The Galana Clinic is the outreach of the Burji churches. It sits in a Muslim village in the Burji Valley. The area is very poor, with no modern conveniences like electricity, good water, or phone service. The clinic was started about 25-30 years ago but was abandoned after funding ran out. We reopened it 9 months ago with 2 nurses, a pharmacist, a lab tech, an accountant, a chaplain, 2 guards, and a housecleaner. The clinic provides basic medical service, similar to what you would find in your doctor’s office. There is no advanced diagnostic capability (ultrasound, X-ray, etc. ), but we are looking for a portable ultrasound machine. The clinic is treating about 1000 patients per month, 99 percent of whom are non-Christian. Every morning Chaplain Solomon and Nurse Birhanu gather the waiting patients, present the Gospel to them (often using flannelgraph or flip charts), and pray for the Lord to bless the day for His purposes. Also, every morning Solomon leads the clinic staff in devotions and prayer time. So far, over 60 people have come to Christ through the ministry of the clinic. After they embrace the Gospel, Solomon works with a local church to provide spiritual mentoring. The ministry of the clinic has been so successful that the Muslim leaders have begun a coordinated effort to close the clinic. During a village meeting one of them stood up and said to the people, “This clinic is not helping us! We must close this clinic!” After his speech, the people rose up in one accord and said, “No! This clinic is helping us very much! We want to keep this clinic open!” So then the Muslim leaders decided to open their own clinic a short distance from our Christian clinic. To their surprise, the people refused to go it. So after 2 or 3 months, they had to close their enterprise. It is no surprise that the Evil One is working hard against the clinic. He hates any work that reflects the Savior. And he despises any effort to introduce people to Jesus. Our prayers for the protection of the staff are critical to the success of the clinic. We must be faithful to pray for each staff person – for their own spiritual life, for protection from discouragement, for inter-personal dynamics and relationships, for administrative wisdom for the church leaders overseeing the clinic, for wisdom in treating illnesses, for grace in obtaining supplies, for protection from sin, etc. There are many points upon which we can pray, and our prayers are a KEY element in the success of the clinic. Solomon, the chaplain. He has a wife and 5 children in another village; he sees them on weekends. He is very enthusiastic for evangelism and godly in his lifestyle. He is happy, vivacious, charismatic, loving, and gentle. Lately, he has been suffering pain in his legs from walking so much; he walks to visit patients in their homes as well as walking around the clinic compound talking with patients. We have sent funds to buy him a bicycle, and we have given him a library of spiritual books as resource material. Pray for spiritual protection, physical health, and continued enthusiasm for his work. Dawit, the senior nurse. He worked for the government clinic before coming to us. He is married with several children; they live in a village about 10 minutes’ walk from the clinic. He is an elder in the church of that village. He is a relatively new nurse, so a concern is his medical knowledge. But what he lacks in medical knowledge he makes up for in humility and teachability. His English is fair; it would be good for him to attend English school. We have given them many medical resource books, and he uses them constantly, but we would like to increase medical mentoring with both Ethiopian and American medical personnel. Pray for wisdom as he treats complicated health situations. The people often suffer from several things at once – malaria + pregnancy, or typhoid + worms, or infection + malnutrition – so it is difficult to differentiate and know how best to treat. Sometimes the treatment for one condition is contraindicated for the other condition! Dawit is responsible for the day-to-day operations of the clinic; pray for wisdom for him as he deals with issues and personality clashes. Any rural medical clinic in Ethiopia is a place of stress, and often that stress shows up in inter-personal dynamics. So far, we are not having any problems, but we must pray diligently against this potential. Birhanu, the junior nurse. He has worked in the clinic for about 3 years. Formerly, when the clinic was “closed,” he maintained a presence and did what he could for the people. His English is very good. Because of lack of funding he could not complete his nurse’s training for the “senior” certification, but it is our desire to send him back for the last year of training. He is very smart and teachable and has great organizational skills. He is married and has a large number of children; his family lives in a large village that is about 2 hours’ walk from the clinic. The clinic license requires a nurse to be available at the clinic 24/7, so Birhanu and Dawit alternate time off. This means that sometimes Birhanu does not get to see his family for 2 weeks! This is a strain on him, but until we can get a third nurse, this is the situation. Please pray for him in this regard – for medical wisdom, for good working relationship with Dawit, for physical strength, etc. He lives in a room on the clinic compound and cooks for himself. In addition to providing medical care, Birhanu is responsible for the operation of the Storage Room. Memiru, the pharmacist. Memiru is a very small man; he is single, and his family lives a good distance from the clinic, so most of the time he stays on the clinic compound. Like Birhanu, he lives in a room and cooks for himself. 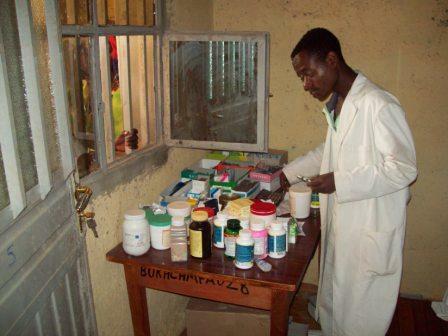 Because of Memiru’s license as a pharmacist, we are able to order medicines in Ethiopia. He is a quiet, gentle, happy man, and he is good at his work. Methodically, he accepts the prescription written by Dawit or Birhanu, he notes that the medicine has been paid for, and then he fills the order, giving careful instructions to the patients. He uses a piece of paper, coiled to make a funnel, as the container for the medicine, and he writes on the outside the name of the medicine. Everything is done by hand from a little table. When he needs more medicine, he goes to the storage room and gets the supply from Birhanu. During our last visit, Memiru was suffering terribly from malaria; he was too weak to get out of bed, and was running a fever. Malaria is rampant in the Burji Valley, especially during rainy season. It is a disease that is transported by mosquitoes; the disease destroys the red blood cells. There are several types of malaria; one of these types will lodge in the brain and kill the patient within a few hours! Please pray for the protection of the staff from malaria and other diseases like HIV or infections brought by the patients. Akelulu, the lab tech. Akelulu joined our staff in February, 2009. He is single and a new graduate. He has been struggling to get all the items needed for a functional laboratory. He was SO excited to see the new microscope we bought, and how it can be joined to a laptop! He draws blood from the patients with a syringe and needle, but he is lacking some of the reagents needed for testing, like gemsa powder. None is available in Ethiopian medical supply shops! So I search the internet here, order it, and send/take it to the clinic. I have a whole list of things needed by him in order to test for malaria, typhoid, parasites, etc. We have a centrifuge that operates well on our solar power. What a blessing to have dependable electricity at the clinic! Commercial electricity is available only in the “county seat” of Soyama Town. And, like most of Ethiopia, it is off more than it is on. So our little Galana Clinic has electricity that is more reliable than the government electricity! In the sea of darkness, it is WONDERFUL to have lights burning at night. Medical care for emergency cases is so much easier when a simple light switch is flipped! Praise God for the technical ability to have installed this power, and pray for Akelulu as he struggles with operating a lab that is under-supplied. 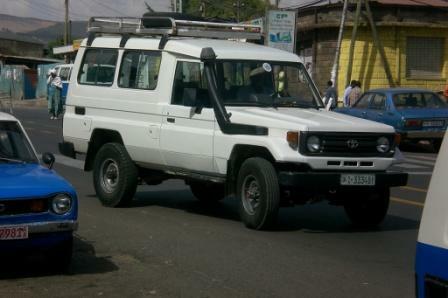 Getting supplies in Ethiopia is a chronic problem: there is no stable source, even in the major towns. Pray for us to have wisdom in how to help them. Teshoma, the accountant. When patients come for the first time, they pay a Registration Fee. And then each time they come, they pay according to the service they receive. This might involve a Nurse Fee, Pharmacy Fee, or Lab Fee. On average the patients pay about $2.50 total, but it varies depending upon the situation. If a patient cannot pay the fee, they may apply to the church for charity. We have yet to have a charity case; the fees are within their capability. Our goal is to make the clinic self-sustaining. Currently it is self-sustaining in pharmacy matters, but not in salary. Year by year, we supplement the Nurse Fee to pay the salaries of the staff; for Year #2, we expect to have to supplement about 60%. Each year we will increase the Nurse Fee until it is sufficient for the salaries. In this strategy we are working to make the clinic strong enough to stand by itself. Teshoma is married with several children. They live in the same large village as Birhanu, but Teshoma is able to see his family every weekend. Pray for spiritual strength to collect the fees and to resist any temptation for stealing; it requires much spiritual maturity to handle money, and the Evil One delights to tempt in this matter. Pray for a sense of unity with the medical staff. Mariam, the housecleaner. She is about 17 years old; she is a very small girl with a sweet, gentle, humble disposition. Every day, either she or one of the guards collects the rented donkey and heads to a distant well to get water for washing and drinking. It is hard work! And every day she sweeps, mops, and washes down the equipment. The earth is reddish, so her work shines only for a few minutes; then new patients track in more red dirt. Until now she has been “mopping” the floors with an old uniform shirt; now we’ve gotten her two good mops (one for washing and one for rinsing) with two good buckets! Also, we’ve supplied sturdy cleaning cloths, gloves, and a uniform top. You can see how even the very basic supplies are difficult to come by! I was trying to find a decent broom in Soyama Town, the “county seat”; only one store carried a broom, but it was far from sturdy. We do what we can do! Mariam attends school half-day (like all Ethiopians), and she works half-day at the clinic. She also washes the uniforms of the medical staff and burns the trash. Pray for her physical strength and diligence in her work. Woche and Mengistu, the guards. These two men are married and have families. They are from the local village and sleep at home when not on duty. They alternate day/night shifts. We have installed outside (“security”) lights around the clinic, and we are building a guard house for them. They are unarmed except for a flashlight; I have now gotten them a shrill whistle to help them. During the night they patrol, watching for thieves (which are common in Ethiopia), and during the day they patrol, monitoring for wayward children loitering on the compound or guiding patients in where to wait, or handling drunken patients, etc. They also manage the clinic garden, pick up trash around the compound, and help in getting water on the donkey. They have requested heavy coats and sturdy shoes to help them in night duty and for chasing thieves. Pray for diligence in their work, that they would be alert and effective, and pray for physical health. Also pray that they will be aware of their work as being a spiritual work, as they interact with patients.